Blend all ingredients except the green crème de menthe. Pour mixture into a highball glass. 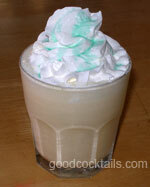 Garnish with whipped cream. Add a few drops of green crème de menthe on top.